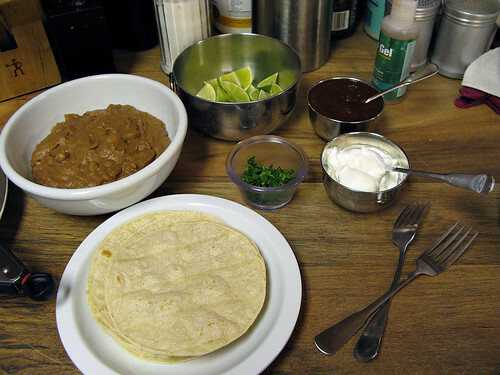 Tonight's garnishes are refried beans, lime wedges, salsa, sour cream and chopped cilantro. Other highly recommended sides are: queso fresco, grated cheese of your choice, salsa verde, shredded lettuce, shredded cabbage, chopped (or minced) onion, sliced radishes, avocado slices, or some full-on guacamole. Most restaurants I've been to that serve this dish serve their carnitas with cilantro, salsa verde, guacamole and lime wedges.